You’ve likely already heard that explainer videos can boost conversions anywhere between ten and ten bazillion percent. 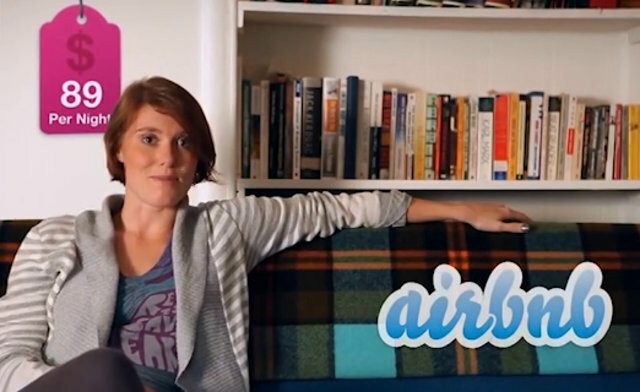 You’re probably even toying with the idea of doing one for your company. The question is… Can you make it any good? With over 100 years of movie & video history embedded in our collective subconscious, your customer’s expectations are really high. 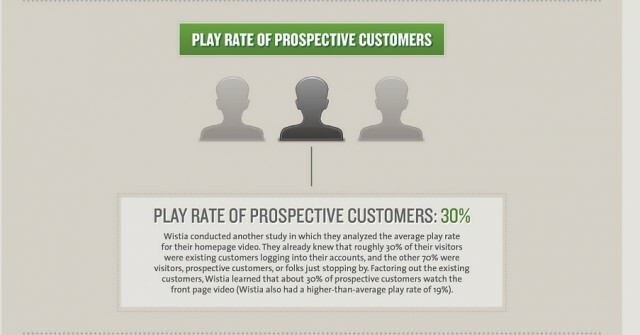 So high that 60% of visitors are far less likely to return to your website if your explainer video doesn’t stack up. Quite simply, an explainer video is a short video that explains what you do, the customer you serve & the problem you solve. 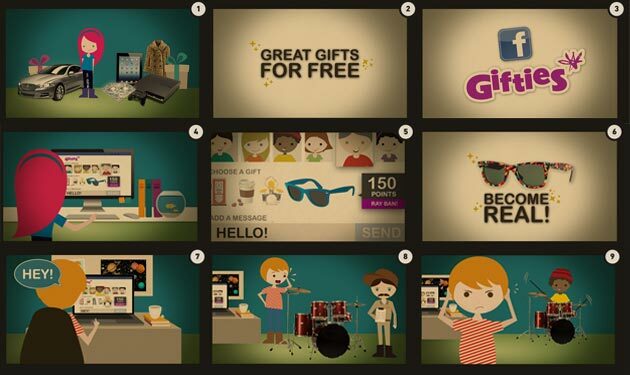 Explainer videos are like value propositions on steroids. A well done explainer video clearly expresses the problem, the product & showcases the company’s personality. Even though your explainer video may incorporate some of these elements, the focus should always on be on clarity first – packaging second. Why Should We Use An Explainer Video? Quite simply, because they work. If you’re a B2B company, you’ll be happy to know a Forbes study titled “Video in the C-Suite” revealed that 59% of C-Suite executives would prefer to watch video over reading text if both are presented on a page. 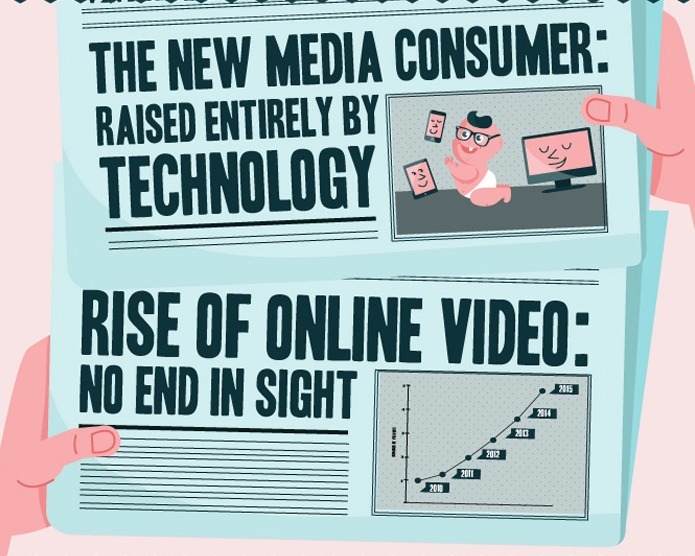 According to this research by iStockPhoto, overall online video consumption has risen by 800% in the last 5 years, doesn’t appear to be slowing down any time soon. It’s also been said that by 2015, 90% of all web video consumption will be by 18-34 year olds – a generation with tremendous online shopping power. Simply put, explainer videos are becoming very difficult to ignore. How Many People Should Be Watching & For How Long? 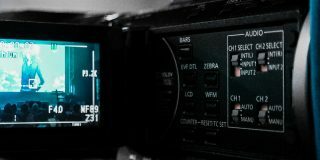 Because many ConversionXL readers are already experimenting with explainer & product videos, let’s look at the benchmark data before we get into what goes into making a compelling online video. We’ll use what we find here to help guide the video (re)creation process in the next section. What’s The Average Page View/Video View Ratio? 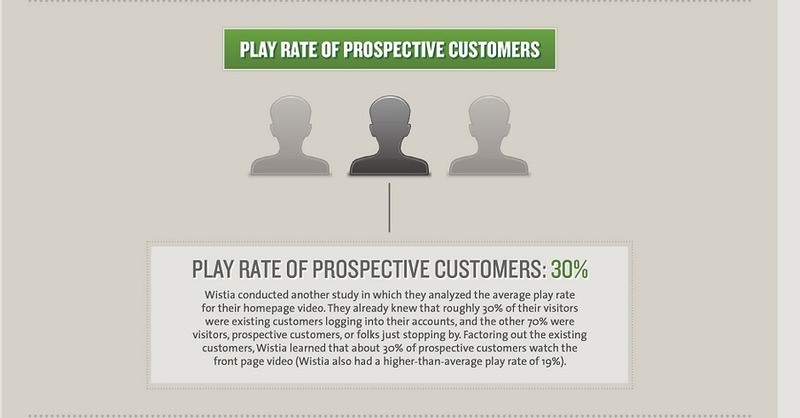 A study by Wistia found the average play rate for “business videos” hosted on their platform was roughly 30%. In another study, Wistia dug into the visitor data for their own homepage video & found that roughly 30% of their video views came from prospective customers. While these may seem like sturdy benchmarks, don’t put too much stock in them. This is an example of “averages lie.” The visitor/view metric is one you should only be competing against yourself on. I’ll explain why in just a bit. Because Wistia hasn’t segmented their “business videos” into industry categories (like Mailchimp does for email ) or provides us with any information on which videos use optimized thumbnails, that 30% benchmark is sadly, pretty useless. According to production company DemoDuck, 3 out of 4 visitors clicked to watch ZenCash’s explainer video. Great right? While 74% video view/page view is impressive, what if the majority of people shopping for invoicing software watch videos – when given the option – instead of scanning a bunch of text? What if it turned out that other invoice software companies saw similar results? Or what if none of the other key players in their industry use explainer videos, so comparison shoppers watch simply due to the novelty of it all? Without knowing the benchmarks specifically for your industry, it’s impossible to know whether this is good or not. It’s also unlikely their competitors will be sharing that information any time soon. Now, hypothetically, let’s say our interview series were hosted with Wistia and their system identified it as a “business” video. Even though it’s not an explainer video, I’m assuming our interviews would be lumped in with ZenCash’s explainer when calculating the visit/view average. Our most viewed video in the last 30 days – my interview with Noah Kagan, had an average of 36% page visitors/video view rate. Our least viewed video had a 23% visitor/view ratio (133 visits/31 views) . The reason relying on visitor/view benchmarks is unreliable is because if I added the traffic from ZenCash & my two videos and divide it by the total amount of views, I’d end up with a 56% visitor/view rate. As I add more videos to that mix (related & unrelated, optimized & unoptimized) that percentage would go down and skew the data beyond all recognition. This also doesn’t take into account other factors like mobile & tablet visitors are 3x more likely to view a video, or that consumption behaviors for mobile are dramatically different than desktop viewers. Sadly, without better segmentation, using benchmark data for visitor/view ratio is pretty unreliable. What is more reliable however is the human attention span. 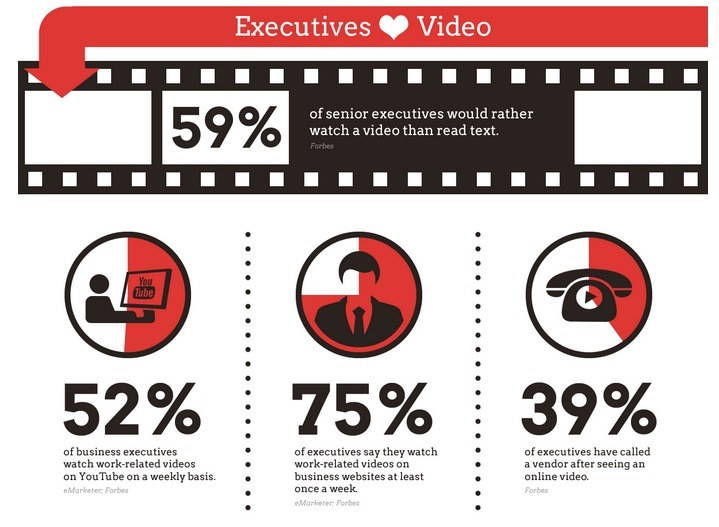 Going back to the Forbes study of C-Suite Executives, over half (57%) reported they prefer to view videos that were between 3-5 minutes in length. 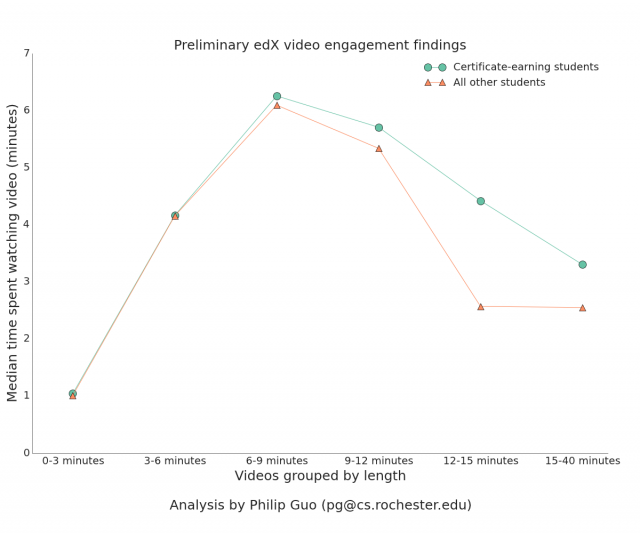 Another study measuring the total amount of time students interacting with educational video found that students were most engaged with videos ranging between 3-6 minutes. Don’t let the longer bar fool you. The 3-6 minute videos had an average of 4 mintues viewed, whereas the 6-9 minute videos, students dropped off almost immediately after the 6 minute mark passed. What’s interesting is that students who were in the certificate program had a tendency to watch longer, suggesting that higher education levels may also result in slightly longer engagement periods. Read: Understand your target market. In another study by Wistia, they analyzed engagement across millions of video views, and found that engagement starts to dramatically drop off somewhere after the 5-10 minute mark. They also found that the longer the video is, the more dramatic drop in the amount of people watching from the outset. What’s cooler & probably more important to see however is the raw data. 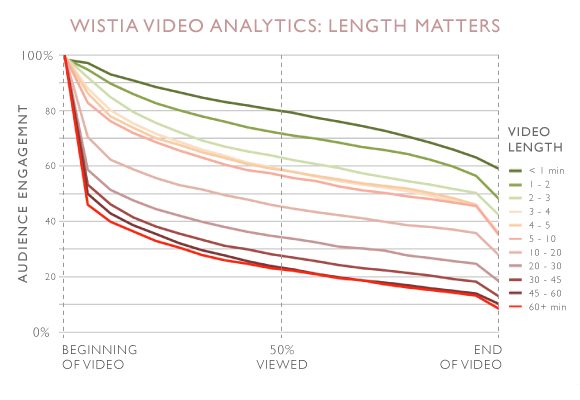 In the graph below each frame of animation shows the total amount of videos being analyzed simultaneously & the orange line represents the average view duration for each length of video. I like this one because it is more honest. Before the 10 minute mark, you see that even though the average still pushes it’s way downward as the video goes on, there are still plenty of engaged viewers watching all the way to the end. My guess is, those “above average” videos speak directly to their viewers and are exceptionally well crafted. Takeaway: Even though the data shows attention spans peaking right around 6 minutes, the context is critical. Because the explainer video is an introduction to the company & the problem, it should be as compact as possible- preferably between 1-2 minutes, to maximize your watch through potential. It’s worth experimenting with longer videos to give more detailed information as your customers move further down the marketing funnel & are closer to making a purchase decision. Ok, So How Do We Make Professional Grade Videos? Making a high quality video isn’t as simple as picking up a camera and shooting. As such, what we’ll talk about in this section is the pre-production production process, which is often overlooked, yet critical to the video making process. To make a professional grade video, you first have to know what style of video will best communicate your message. If you find yourself saying “Let’s do a whiteboard video because they look cool!” you’re doing it wrong. The style of the video sets the tone for the company’s personality, and helps to position the product in the most powerful way possible. It also uses high resolution imagary and sneaks the price tag in the shot – giving the video a similar experience to browsing their website. Overall, the video is crafted to maintain flow, and prime the viewer to be comfortable & interested in using their service. After you’ve settled on your video’s style, you need to focus extensively on your script. Neil Patel, co-founder of CrazyEgg says that even though the video below brought in an extra $21,000/ month back in 2012, it was the script that was really responsible for such incredible growth. Generally speaking, 1 minute of video = 150 written words so everything has to be as conscience & to the point as possible. Unless you have someone in-house who has written amazing explainer video scripts before, I’d recommend working with a professional who specializes in the format. Also, always do qualitative research & conduct customer development interviews to help your script address as many pain points as possible. Tools like Qualaroo & SurveyMonkey can be extremely helpful in this situation. A major problem with creating explainer videos is that nobody else can see the movie that’s playing in your head. While that seems fairly obvious, the biggest source of stress and frustration with making videos is when two (or more) parties see a different movie in their head & fail to show each other what they’re imagining. Avoid the headaches and use storyboards. When everyone knows what the video will look ahead of time, everyone stays on the same page & there is little room for confusion. …or you can get really detailed. “In animation, it is so expensive to produce the footage, that unlike live action we cannot have coverage. We can’t do multiple takes of a scene…. 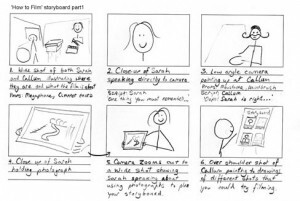 This tutorial series on Vimeo is an excellent primer on storyboarding. If you want to make the most out of your explainer video, you need to watch it. Fun Fact: Pixar has never made less than $360M in worldwide box office. An animatic is a rough version of the video that combines your storyboards with rough idea of the music, sound & voiceover you’ll use. While an animatic seems like an extra step, it’s one that will give you a true sense of what everything will look and feel like once it’s in motion. “…when something seems to be working great then we’ll go on to the editing system and we will make a version of the movie using the still storyboard drawings. And we’ll put our own voices in it as scratch voices, we’ll get temporary music from some soundtrack album that has the right emotion we want, and put sound effects in there. And we can literally sit back in a screening room, press a button — no excuses, no caveats — and we just watch the movie with still drawings. I will never let something go into production unless it is working fantastic in that version with the still drawings. Because no matter all the great animation you can do will never save a bad story. We will work and rework and rework and rework these reels — sometimes thirty times before we let it go into production. We’re really adamant. Even though many explainer video companies don’t offer an animatic in their workflow, I still recommend doing one as it’s something you can show your most loyal customers & test for feedback. It’s also important to note, animatics are simple to create and can be made in Windows Movie Maker or iMovie. From lighting, audio recording, cameras & music selection, there are too many extra things that go into making high quality videos to cover here. If you’re shooting live action, I recommend checking out Wistia’s video production tutorials to get you started. If you’re doing animation: hire a professional. By combining both user generated & professional produced video resulted generated +35.3 points with comScore’s “Share of Choice.” metric for featured products & +28.0 points for the brand’s total line. comScore also found that combining video types resulted in customers feeling more emotionally connected to the video content along with other key areas you or I might find important to increasing conversions. Who Are The Good Explainer Video Companies? To wrap this up, here’s a list of some of the best explainer video companies out there right now. I’d also recommend you check out Startup-Videos.com if you want to find a specific style of startup video. Ezra from Wistia here. I appreciate you sharing some of our studies but I do have to defend the playrate data. From my understanding talking to the people on your social media team, you guys are actually in the process of better segmenting your data, yeah? While it is useful to have, because there isn’t a whole lot else out there, the data itself can’t be very accurate IF it’s being lumped together. Let’s take it away from video for a second, and say we’re looking at visitors/email signup rates. If I have bots (like Google, Amazon, Bing, etc) counting as visitors to my blog, and the conversion to my email list is 10%, when I take out that fake traffic – which will never ever convert – my conversion rates will go up, and be far more accurate. 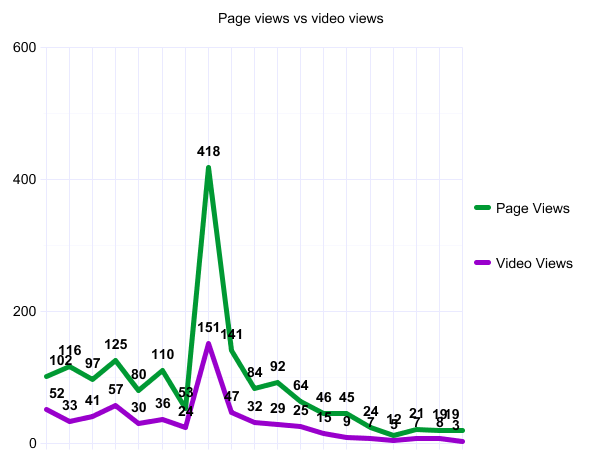 If my “business” is selling automobile parts where I give tutorials on how to install parts, and your “business” is video hosting where you use explainer videos to describe the benefits of using something other than Youtube to host videos, I will naturally have a higher page view/play rate metric than you. It’s the nature of my videos. However, when you put your videos in with mine, it’s going to drag my average down. Suddenly, I will think my personal play rates are well above average. On the flip side, you’ll end up chasing a benchmark that may be completely unrealistic because your industry benchmark might be lower, just given the nature of your videos. IF you wanted to lump data together like that, it might be better suited to break “business videos” into just explainer videos. Likewise, you could segment to show only videos embedded on software websites, or ecommerce sites, or break it down by industry. What I’m realizing now, and what’s not entirely clear in the study, are you analyzing just YOUR videos? And not the customers that are hosted with you? 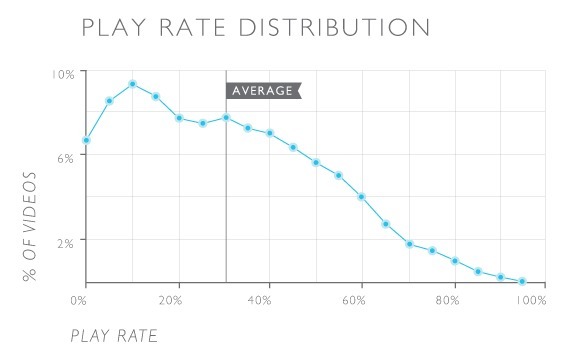 You say “The chart below shows the distribution of play rates across all of the business videos hosted by Wistia” so if that doesn’t include customers that makes sense. I agree, if you’re doing a video, you should find the benchmark across all of your videos to get an average, but you should also look at the specific category of video to get a more specific look. Well.. that shut her up didn’t it. Has anyone done studies to figure out the best way to display the explainer video on the homepage in order to increase conversions? Should the video be the focal point? I started looking shortly after seeing your comment, but sadly have not found anything yet. However, this would be easy enough to split test. If you were to upload multiple versions of the same video to your host, and create variant pages with different locations, you could easily determine which location gets more plays. I would think making video the focal point would be the best to get plays, but I would also test things like the video thumbnail, the headline, and other elements that “frame” the video. It may also be worth testing a “light-box” popup version of the video vs non popup. If your sample size is large enough, there are a lot of things you could test. The most important thing is that you take action on it. 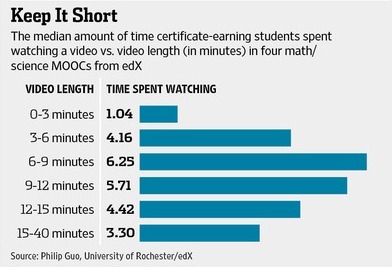 Re: “What’s interesting is that students who were in the certificate program had a tendency to watch longer” – I’d be interested to see some statistics on how the level of investment of the user effects viewing times. Perhaps a student in cert program has invested time, money and their career on it and so will watch longer. So if you have a really dedicated and invested user base like say Apple, your users may happily watch for and extra minute or two. 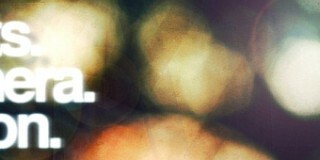 Thanks Tommy for another great article form ConversionXL. Really appreciate the research that goes into these. Funny you say that Daniel, I do have some research that examines the viewing behavior of avid video watchers. I will dig it up and post the link in a bit. After 1mm data points we can say at a near certainty anything much faster than 145 WPM DESTROYS conversions. As in is a huge blow. So be careful with what you say. People are encountering it for the first time. What do high authority people sound like? Probably 135-150 WPM. We live in a visual world, so we have to lose the low end “this is joe, joe has a problem” swill and go for some creative visual metaphors. People will retain and react to that. Not to the talking cartoon contrivances. A lot of useful & detailed information that we use daily. One point I’d like to raise. We always write the script first and then work on the concept/style of the video. I feel that there should be no restrictions when writing the video, not even what it will look like. Why have the style influence your scripting decisions? As an example. If I knew I could get Jack Nicolson as an actor for my short film, I’d write the short film around a character I could imagine Nicolson playing, rather than writing the script that I really wanted to make. This knowledge would influence my storytelling. This is why casting is usually a test set for post scripting.